Educational Requirements: Bachelor's/Master's degree in Library Science/Information Since/Documentation or an equivalent) professional degree with at least 55% marks or its equivalent grade plus a consistently good academic record and at least 05 years of relevant experience. Experience Requirements: (a) Specialized course in Computer Applications & Networking. (b) Experience of working in Computerized Libraries. How To Apply: The candidates fulfilling the above qualifications may submit their applications on the prescribed application Form along with testimonials and latest photograph to Dy. Registrar (Admn. ), Estt. 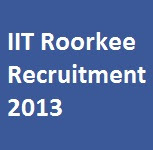 (A) Section, Indian Institute of Technology Roorkee, Roorkee-247667 (Uttrakhand).